HRMantra Software is best and powerful HR software that has been developed after an extensive study on the market requirements. HRMantra’s Human Resource Management System allows you to track all employee life-cycle activities and extensive employee information. It’s now easy to have accurate and ready-to-use employee information in one central location. The multilingual, modular, scalable and database independent application framework makes HRMantra robust software product more sought. HRMantra solution is leading the most powerful HR software that can run on-premises or on the hosted environment and comes with best-in-class service and support, creating the ultimate HRMS user experience. 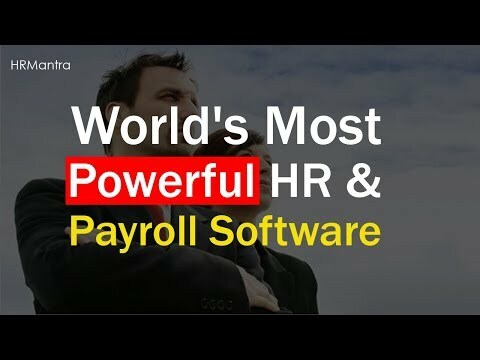 HRMantra is the world's most powerful HR & payroll software helping automate the most complicated hire to retire HR processes rapidly using its off-the-shelf ready to use parameterised features. Established in the year 2000, company has invested more than 750 Man years in HCM software to help give the customers more than 10 times ROI and help achieve enormous time saving for its employee driven processes. HRMantra is available on both on-premise and cloud models and has a fully integrated Mobile App for the Self Services driven functions. We are committed to keep continuously innovating rapidly in order to give the best services and deliver excellence in every aspect of HR Automation. Pick up real time attendance data from any reader automatically globally & calculate very powerful late coming, early going and overtime policies with HRMantra. HRMantra HR software has a global leave module-we can set leave system for any firm worldwide however complicated in a few hours. Any kind of workflow request ticket can be raised, escalated to the desired employees & its progress can be tracked to see whether that issue is still open or closed. Create any kind of PMS like 180 or 360 degree system based on competencies & KRAs weightages for each group & generate bell curve analysis. Create LMS based on training cycles, identify training needs, get feedbacks & monitor competencies acquired with HRMantra. Using HRMantra humarn resource management software you create client projects, assign employees, monitor their timesheets & work out project profitabilities. Q. What is HRMantra software On Demand service? Q. What are the benefits of HRMantra software? The benefits of HRMantra software include.Robust growth - End-to-end automation helps you focus on growing your business, Complete visibility enables quick & smart decisions. Better management - Ensures access anytime anywhere, Supports regulatory compliance, Enables delegation & improves control, Cost savings - No Capital expenditure. Minimal operating expenses only, Start with what you need and scale as you grow. Maintenance free - technology upgrades & data, Dramatic reduction in recurring IT costs. Increased profitability-Enhances visibility & ensures optimal utilization of materials, machinery & manpower, Maximizes on opportunities, Reduces business cycle time, Optimizes working capital. Companies can start benefiting from HRMantra software in very a short time due to lower investments and minimal implementation times. HRMantra software adapts to changes. Q. Is HRMantra On demand software too expensive? The option of running own IT department is extremely expensive. HRMantra on demand software comes without infrastructure costs, technical resource costs, AMC and other hidden costs normally encountered in a conventional ERP. The customer pays a nominal subscription for availing the service. Hence, HRMantra software provides high predictability and is very affordable. Q. Can HRMantra software be customized? Yes, HRMantra software can be customized. HRMantra software has all the features required to run an organization; if customization is required, we do it.